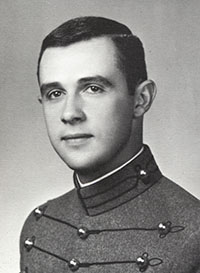 View a eulogy for Kenneth Russell Grice, USMA '66, who passed away on December 4, 2018. Laura, Erik (our son), and I had the distinct honor of serving with Ken, Jan, and their family, in the Physics Department at West Point from 1976-80. Ken had already returned to the Academy as an instructor, and so became a mentor to those of us newly arrived. Ken struck me immediately as an outstanding officer, instructor, and man of principle. We formed an immediate friendship, which soon included our families. Perhaps the occasion I recall best, was the weekend when Ken, Jan, and the kids came, with their two Rupp snowmobiles, 300 miles north, near Lake Placid, NY, to our camp in the Adirondacks. None of our three snowmobiles seemed to want to function reliably in the very cold and snowy conditions, and we spent quite a few hours managing to make little progress in the wintry deep freeze. Fellowship around the wood fire, sipping hot chocolate, however, was indeed a time we shall never forget. We remained in contact with the Grices through the years following West Point: watched Ken emerge as a force to benefit the Academy in several assignments in the administration, and begin his life long journey as caregiver to Jan as she developed Alzheimer's. Year after year, we would exchange Christmas cards and letters with Ken and Jan, then Ken alone. Our hearts broke as Ken soldiered on. And then, two years ago, we received no reply to our letter to Ken. We tried once again this Christmas (2018), then found through a web search, that Ken had passed away December 4. Rest in peace, Ken. Well done, thou good and faithful servant!